At one end we are talking that people are compromising the good habit of reading with other entertainment options and on the other, we see a bunch of new authors is entering the arena. While some of them deliver really good books and some chose a nice subject as well; others are not that good. Even some of them are really delivering some crap in the name of entertainment. Some of them feel that using cuss words and writing adult content is their privilege. In the name of reality, you cannot deliver semi-pornographic material for sure. Anyway, as mentioned earlier, some of the writers are really good. Recently we are impressed with some authors like Deepak Kripal (author of The Devil’s Gate : An Impossible Journey: 1), Poulomi Sengupta (author of The Last Bloom) to name a few. Even Warrior by Oliver Lafont is good. Adding to the list is Salil Desai, whose police procedurals are worth to explore. (We are excluding the names of some famous authors whose book are already bestsellers) And, here comes Rahul Mitra with his maiden book The Boy From Pataliputra. Let us take a bird’s eye view to the plot of the book. On a note, please remember that, I will try to keep spoilers at the bay, but at least some of them are inevitable. Aditya is a young boy living in Pataliputra. Ajeet, his elder brother is the world to him. While Ajeet is quite fond of the rules and the system, Aditya was living like a free bird. In the time when birth based caste system was respected by Ajeet, Aditya didn’t care if his friend is of lower caste or otherwise. Indukalpa, the kotwal of the city was stubborn and straightforward. When it comes to the law, he observes only one way – follow the rule or ready to get punished. One fateful day a complicated incident handled by Indukalpa in his traditional way and Ajeet was asked to execute his order, the things went wrong. (Actually, it was a farmer’s land which was illegally invaded by some monks who have started building a monastery there, and the land owner lodges a complaint with Indukalpa.) Despite Ajeet’s best efforts and genuine behavior, the things went wrong as one of the monks was died in place. At the same time, Indukalpa was offered the place of chief justice by the king and Ajeet was promoted as Kotwal of the city. The case of “death of the monk” took a political turn and came to Indukalpa’s court. He knew the facts and actually it was him who ordered the things (as Kotwal), so he knew that Ajeet is not guilty of doing anything wrong (and actually there was nothing wrong done by him), he wanted to make him free on the spot. The things took an ugly turn when the king’s messenger come with a message. Despite knowing the facts, Indukalpa did something he shouldn’t. It was all to save his own neck. And, Ajeet was given the death sentence and all his wealth was seized! Aditya is now all alone, and he is hunted by the authorities. How his life takes a turn from here and how he fights the battle of life is the rest of the story. While most authors these days try exploring something which appeals the majority of readership, there are only a few who try to write something with substance. We consider The Boy From Pataliputra is once such attempt by Rahul. The first chapter of the book is not very effective, personally, after reading it I doubted about exploring the book further. But, once you start exploring it forward, it will take you in a specific “reader’s zone”, from where it is tough to escape. The events we have mentioned in the plot above will grip you so tightly that you will start seeing from the eyes of Aditya. The hurdle he went through, the way personal interest can bend the thing, the importance of genuine friendship and never-say-die attitude in one’s life is conveyed nicely. The author is good at building scenes and explaining situations. The characters are built pretty nicely. The book maintains it’s pace almost throughout. The author has some strong opinions and he doesn’t hesitate to talk about it. Most importantly he has a clear vision. The dialogs are written in a layman’s language and thus appeals the readers. At the same time, some philosophical stuff and harsh realities of life are explored well too. Here are some of the lines from various segments of the book which we found really good. It’s not easy to make one’s living Aditya. Life is tough and one has to put up with a lot of nonsense, swallow humiliation, and stress, from time to time, and work very, very hard. You need to understand this. I know you want revenge, but this is not the time, son. You are not strong enough. First take care of yourself, become something in your right, and then when you have the power and strength you will also get your revenge, if the gods will it so. Till then, be patient – watch and learn, keep your mouth shut, and your eyes and ears open. You’ll do that, won’t you now? Remember, a man never blames others for his situation or circumstances. The road ma be long and dangerous, there may be storms, or rain, or sun outside, but the one in the saddle will always be you. That’s what it means to be a man – that you are in charge of your own life. Rishabha would invariably end up upsetting some of them with his theories by saying things like: man did not need to consume luxuries to be happy. He blamed the merchants for creating desire among citizens, for things that were not required, and thus, of promoting unhappiness in society. Poverty not only physically debases a man, but also crushes his spirit by stripping away at his dignity. Time is the most elastic of concepts. When one is desperately waiting for a situation to change, even a day can seem like a month, while at other times, entire years slip by unnoticed. It was late afternoon and the sun hung low in the western sky like an angry ball of fire. With the last of its remaining strength, it beat down its bloodthirsty scorching rays on the backs of five students who sat in a semi circle on the ground. A grim dance was playing out in the middle, a lioness holding off a pack of jackals. You want respect but intimidation and force will get you only fear and resentment, they can never get you respect. That comes from character, from a lifetime of choices made and actions taken. People respect wealth and power in this world, my friend, and no one cares for a man with no position and no wealth, no matter how idealistic they may be. Another good thing is, the book can be read as a motivational one also. It shows us how circumstances can change a person. 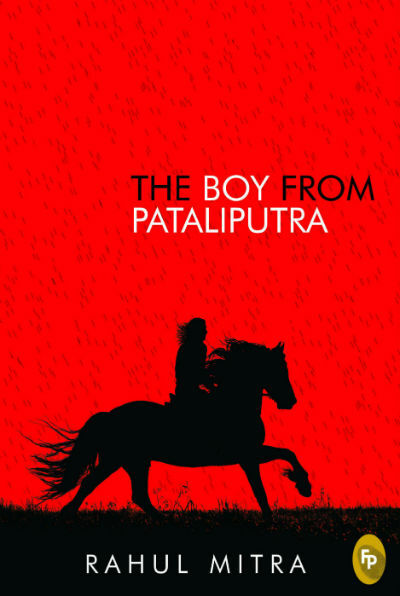 The transition of Aditya to become the man his brother wanted him to be, from a boy from Pataliputra is worth reading. The first impression I got from the book is that it could be an exploration of the story of Chandragupta. The book mentions Chandragupta and Chanakya, but it is not about them. The protagonist is a common man (who was a boy for the most part of the book), who, in his journey moves ahead and fails at places. The important thing is he learns from it and bounces back. The book is a historical fiction so there is no need to find historical accuracies in the book, especially from the critical point of view. He, at places, leaves an incident halfway to let your logical reasoning and imagination conclude it yourself. Rahul shares his reasons to portray the stuff in that way in the book, for example, take a look at the way he portrayed the end of the fight between Alexander and Porus. While Tanku’s Dhaba chapter is important in the book, it is something I found disappointing for various reasons. The book has several proofreading errors (mainly missing space between two words). Also while the author took utmost care to mention ancient names of countries and states, there is a place he mentioned “India”, and that too from the characters which shouldn’t have said that word (Bharata or Bharat should be there). Also, the words like “arrey” or “saale” may be found out of context (in terms of book content) by some readers. Political and geographical maps at the beginning of the book, glossary, and notes at the end of the book are other positive aspects of the book. Worth to mention, simple yet effective cover page of the book. I must mention that Rahul is not just any other author who write as per his imagination. His detailed research for historical incidents, sword fighting, war techniques and other stuffs is quite visible in the book throughout. The vulnerability of teen-age is also explored evidently in the book. Definitely a worth reading book. It has it’s own low points, but there are more highs than the lows. If you can read using an open mind and have an attitude to read something with substance, then, this book is definitely a good choice. We would give it at least 7.5 to 8 stars out of 10 without hesitation.